Ottawa is Canada’s enticing capital and Ontario’s historic and cultural hub, boasting picturesque waterways, excellent food hubs, stunning architecture, world-class museums, lush gardens and parks, colourful neighbourhoods, cocktail bars and happening festivals. 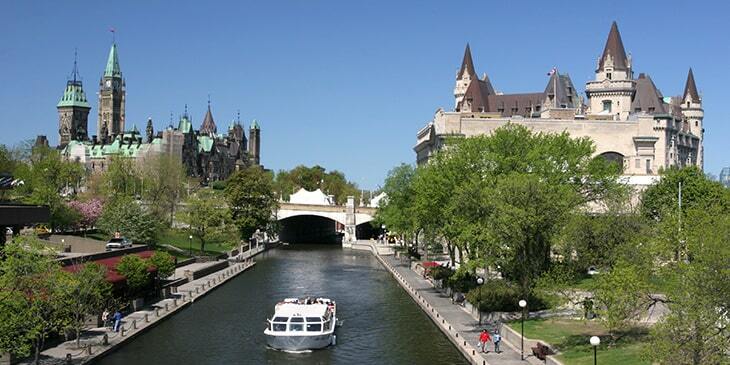 This multi-cultural city is also home to many iconic attractions and landmarks; Rideau Canal adds to the city’s charm, a beautiful World Heritage Site that first opened in 1832, significant to Canadian heritage. Here you can enjoy a relaxing cruise along the canal, go fishing and take advantage of its surrounding attractions including cycling and walking paths, dining venues, picnic spots and more, which are best enjoyed during the warm summers. In the winter the canal freezes over, which is also an interesting sight as it becomes the world’s largest outdoor skating rink! Another icon of Ottawa is the bustling ByWard Market; it’s one of the city’s most iconic attractions which is home to a range of shops, boutiques, market stalls and food shops, as well as restaurants, pubs and bars – it’s very atmospheric and great for people watching. Brightsun Travel offers an extensive range of Ottawa flights from India, taking you to the very heart of this charming capital. Ottawa is home to lots of world-class museum and gallery spaces, introducing you to the city’s and country’s admirable art, culture and history. Visit the Canadian War Museum, an architectural marvel that illustrates all about Canada’s rich military past through insightful exhibits and three million artefacts and items, including memoirs, uniforms, medals and rare vehicles. The Canadian Museum of Nature is another excellent venue boasting one of the finest natural history and science collections in the world, with captivating galleries showcasing fossils, specimens, artefacts, interactive games and much more. Then there’s the cutting-edge National Gallery of Canadian Art which is home to the world’s most comprehensive collection of Canadian Art, which includes drawings, photos, paintings, sculptures and prints. After all of the sightseeing and activities, why not respite to one of Ottawa’s lush green spaces? Two beautiful spots include Major’s Hill Park, which offers alluring views of the Rideau Canal Locks, Ottawa River and Parliament Hill, and Andrew Haydon Park which is a serene hidden gem of the city with scenic walking paths and waterways. Book cheap tickets to Ottawa with Brightsun and look forward to boundless fun and exploration in this enticing Canadian capital.